Tindaloo in CyberSpace: Christmas card in June! Tror jeg har nevnt det før ~ Penny Black var min første stempel forelskelse ♥ Sånn 10+ år siden begyndte jeg å bli stempelgal.. og de første i samlingen min var PB stempler med bla. nusselige pusekatter, mus og pinnsvin, som kortet jeg viser litt lengre ned. Da fantest ikke clearstempler, de kom montert på tre klosser, og på ezmount eller cling som det også heter. The cute caroling mice motif on the christmas card is from a Penny Black clearstamp set named 'Christmas Critters', and if you should want to see more PB stamp creations by me you can click *here* to go to all those I have blogged before. Oh, and did u see I have an awesome new Blogcandy? I enter my 🐭 card in theese fab Challenges: [Ends on] checked july 14th. Stamps/Images: Penny Black stamp. North Star Stamps CS A5 'Juletekster 09'. Scrappers Choice CS 'God Jul journaling' & 'Julekule'(ornament). Panduro Hobby Clear stamp 'Ginger Party NO' (snowflakes). Papers: I prefer Canson Montvale aquarelle paper (200 g/m coldpressed) for my motifs. Bazzill cardstock. Plain white cardstock. Panduro Hobby blue bling/glitter cardstock. Designerpaper '..added later..?'. Dies: Creative Expressions - Sue Wilson die Festive Collection 'Christmas Scene mini background'. Marianne Design Creatables 'Horizon Pine Trees LR0283'. Simply Cards & Papercraft magazine #168. with the free 'Scenic Winter' border die set. Essentials/Adhesives: Double sided tape. Rangers Glossy accents, Tim Holtz stickles. Techniques/Mediums: I used misc. Luminarte Twinkling H2o's Shimmering Watercolors, and Tim Holtz Distress Ink pads & markers to watercolor and distress image and papers. Versamark inkpad, a heat gun tool & clear embossingpowder. I first heat embossed the mice, stamped off on postit note, fussycut them out and used as masks. Also used a scrap paper I cut in a wavy edge as a mask for snowdrifts and a circle for the halo of the lantern. After stamping the sentiment I misted lightly over the whole image with a mica + water spray. The star is from a Panduro stencil, made with Inka Gold platinum silver paste I think. So cute mice on your beautiful Christmas card!! :) The gorgeous Creative Expression diecut panel framed them perfectly! 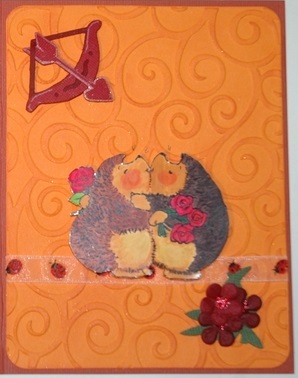 Love the sweet colours and how you arrange always the inside of your cards, they look very professional. So lovely... Just love wonderful frame and cute image. I am pleased that you decided to join this month's challenge at 2 Crafty Critter Crazies. You can submit up to five different projects (as long as they have a critter), so I hope to see you again. Likte godt rammediesen du har brukt på framsiden,passet godt til Penny Black stemplene.